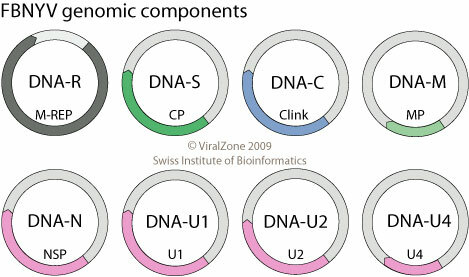 In addition to genomic DNA, up to 4 satellite-like DNAs are commonly found, usually encoding for accessory Rep proteins (para-Rep). These satellite-rep proteins are only able to initiate replication of their genomic DNA, unlike genomic encoded Master-Rep (M-Rep) which promotes replication of all 6-8 viral genomic ssDNAs (trans-replication). Each ssDNA genome segment is monocistronic. FBNYV:West Asia, North and East Africa, and Spain. ASSOCIATED DISEASES Stunting, severe necrosis and early plant death. TRANSMISSION Vector=Aphids (Aphis fabae, Aphis craccivora, Acyrthosiphon pisum). The virus does not replicate in this vector. Nanovirus Clink protein is responsible for inhibiting host retinoblastoma protein and inducing transition from the G1 to S phase in preparation for virus replication since the virus targets differentiated non-dividing cells. .